in the eyes of some angry Greeks and Romans, that is. Followers of Jesus, like others devoted to the God of the Judeans, were among the most odd inhabitants of the ancient Mediterranean world when it comes to their attitudes towards the gods of others. Virtually everyone agreed that there were many gods, and that each home, association, city, ethnic group, or empire might have its own favourite deities without denying others. Few beyond those who honoured the Judean God were concerned with denying the legitimacy of other gods or with questioning other peoples’ practice of honouring their own gods, even if they looked down upon people from another ethnic group or place. Monotheism was not the norm in antiquity. It was an anomaly. As a result, some Greeks, Romans, Syrians, Egyptians, and others had difficulty making sense of the Judean focus on one god, which seemed to them the equivalent of denying the gods altogether, of “atheism”. Despite other ways in which they made a home in the Greco-Roman world, this is where the early followers of Jesus were at odds with surrounding culture, and it could be a source of harassment, abuse or even violence. In times of trouble or catastrophe, fingers began to point at those who failed to honour the gods properly, at the “atheists”. The gods were punishing people through natural disasters, such as earthquakes and fires, because the gods were not being honoured fittingly and atheists like the followers of Jesus were being blamed. This is why, in part, the emperor Nero could choose the Christians as a scapegoat for the fire that took place in Rome in 64 CE (see these sources and translations see Early Christians through Greco-Roman eyes). The Roman historian Tacitus (writing around 109 CE) relates how rumours were spreading that Nero had intentionally started a fire in an area of town where he had hoped to rebuild and renovate (Tacitus does not like Nero, by the way). To distract away from these rumours, which Tacitus implies were true, Nero was looking for someone to blame and he chose “a class hated for their abominations, called Christians by the populace” (Tacitus, Annals, 15.44). Tacitus relates how these “superstitious” Christians were tortured and killed in a disturbing display, a display that was so over the top that it went well beyond any “hatred” that the populace had, or upper class disdain Tacitus had, for these little known worshippers of the Judean God and followers of an obscure criminal executed under Pontius Pilate (as Tacitus would put it). Those who denied that they were or had been Christians and called upon the gods with the usual formula, reciting the words after me, and those who offered incense and wine before your [emperor Trajan’s] image — which I had ordered to be brought forward for this purpose, along with the regular statues of the gods — all such I considered acquitted — especially as they cursed the name of Christ, which it is said bona fide Christians cannot be induced to do (Pliny, Epistle 10.96). So the denial of other gods was perhaps the most important source of conflict and the strangest thing about devotees of the Judean God and of Christ. So far, I’ve not mentioned any cases where Christians are explicitly called what is implied in the cases discussed so far, namely “atheists”. Actual martyrdoms of Christians were not very common, but when anger towards Christians reached the point of violence and death, other Christians were careful to remember the deceased who were considered martyrs, “witnesses”. “Therefore, when he was brought before him, the proconsul asked if he were Polycarp. And when he confessed that he was, the proconsul tried to persuade him to recant saying, ‘Have respect for your age,’ and other such thngs as they are accustomed to say: ‘Swear by the Genius [guardian spirit] of Caesar; repent, say, ‘Away with the atheists!’ So Polycarp solemnly looked at the whole crowd of lawless heathen who were in the stadium, motioned toward them with his hand, and then (groaning as he looked up to heaven) said, ‘Away with the atheists! '” (Mart. Poly. 9.2; trans. by J.B. Lightfoot and J.R. Harmer and revised by Michael W. Holmes, The Apostolic Fathers [Grand Rapids: Baker, 1992]). Similar charges of “atheism” and “impiety” were brought against Christians in Lyons in France in the 170s CE (see H. Musiurillo, Acts of the Christian Martyrs [Oxford: Clarendon Press, 1972], 64-65). The perception of early Christians as atheists was not uncommon. Categories: Christian origins and literature, Greco-Roman religions and culture, New Testament course series. November 9, 2007 . One of the things that needs to be emphasized when approaching the study of early Christianity is the fact that the early Christians, and the writings they produced, were part of a real world (for my course outline and discussion notes for Christian origins go here). Writings such as those found in the New Testament were not floating up in heaven somewhere. Instead, they were written by real people in real places. As a result, they both reflected and were products of broader social and cultural contexts, both Greco-Roman (or Hellenistic) and Judean. On the one hand, it is important to consider the complicated conglomeration of things we scholars simplify with labels such as “Hellenistic (Greek) world” or “Greco-Roman world”. There is far too much to cover under such terms, but among the issues are the ways in which Hellenistic (Greek) culture came to prominent position in the ancient Mediterranean, something that I have discussed in a post on Alexander the Great (d. 323 BCE) and Christian origins (NT 1.2). You might also get a taste, but only a mere taste, of how complicated this world was by reading some of the posts in my category Greco-Roman Religions and Culture. There is a sense in which dividing the Judean world from the Hellenistic world is itself a problem, since the two cultures were in interaction for more than three centuries before the emergence of the Jesus movement in Judea. A similar thing could be said of interaction with Roman (better: Greco-Roman) culture once the Romans were in charge of things (beginning in the second century BCE but climaxing with the imperial period, beginning about 31 BCE). The so-called Maccabean revolt of the 170s BCE, which I discuss in ‘Tis the season . . . : Jewish and Roman holidays, involved a sustained war arising from conflicts with certain actions by Hellenistic rulers and those Judeans who adopted certain aspects of Hellenistic culture. However, the relation between Judaism and Hellenism was by no means entirely hostile, and there were varying reactions by Judean individuals and groups to particular facets of Greek culture both within Israel and in the dispersion (cities across the Mediterranean). The fact that the Hebrew Bible was translated into Greek (a translation known as the Septuagint = LXX) beginning in the third century BCE is indicative of the less antagonistic interactions that were going on in various places. This discussion of varying Judean responses to Hellenistic culture segues well into the second main cultural sphere: Judean culture. To understand a movement that began within Judaism, such as the Jesus movement, one needs to consider Judean culture in its many forms in the first and following centuries. This is a tall order, since Judaism itself was marked by a variety which I have discussed in posts including Let’s talk about sects: Diversity in Second-Temple Judaism (NT 2.3). The Jesus movement was just one among many groups within second temple Judaism and it is important to consider how to plot out these followers of Jesus in relation to others. As we shall soon see in the case of Paul and the situation at Galatia, even early followers of Jesus could have different answers regarding the relation between the Jesus movement and certain aspects of Judean culture (circumcision among them). There is a sense in which a course on the New Testament or early Christian literature is, through and through, a study of these two worlds and the interplay between them. So we will continue to struggle with these issues for a while. Categories: Christian origins and literature, Early Judaism and the diaspora, Greco-Roman religions and culture, New Testament course series. September 25, 2007 . For quite some time, I had been meaning to refer to a couple (now a few) useful sites for the study of Paul of Tarsus, a.k.a. the apostle Paul. There is an extensive website on Paul by the late J. Peter Bercovitz (University of Edinburgh): “As Paul tells it . . . “. There you can read about a variety of important historical issues surrounding this self-proclaimed apostle (through the lens of one particular scholar’s historical interpretations, of course). Another important issue in the study of Paul is the question of who were the followers of Jesus that Paul opposed. Jerry Sumney has done extensive research on the question of Paul’s opponents, and he has also done a brief web write-up for the Bible and Interpretation website: Who are those “servants of Satan”? There are many other useful articles on that same website, which I may come back to another time. A third very useful site is The Paul Page: Dedicated to the New Perspective on Paul (by Mark M. Mattison). There you will find brief discussions and many links to resources regarding Paul within the context of second-temple Judaism. Scholars such as E. P. Sanders have been instrumental in revising our view of Judaism in Paul’s time and Paul’s relation to the various groups within Judaism; this view is known as the “new persepective”, which is very well explained on that website. Categories: Biblical studies links and carnivals, New Testament course series, Paul of Tarsus. November 13, 2006 . One thing that is difficult for modern students to get their minds around (and, perhaps, for modern lecturers to explain properly) is the range of methods or styles of interpretation employed by first century Jews like Paul (who was trained as a Pharisee, of course). When a person like Paul approached the Jewish scriptures, he had a variety of options on how to extract meaning from those writings. And these options go far beyond what a modern person would consider a “normal” method of interpretation, of getting the meaning out of certain passages in the Bible. Among these styles or methods of interpretation were: 1) Midrash, 2) Pesher, 3) Allegory, and 4) Typology. There are times when a number of methods are employed at once, and the lines between these modes of interpretation can be blurry, I should add. It is the modern scholar that speaks in these clear-cut terms more so than the ancient intepreter; nonetheless there are times when, for instance, Paul explicitly says he is putting forward an “allegory” (Gal 4:24) or when an author of Daniel or of one of the Dead Sea scrolls repeatedly speaks of his “pesher” of a particular prophetic writing. 1) Midrash, which comes from the root “to study” or “to interpret”, comes closest to what we as moderns would call interpretation proper. But even so this involves going beyond what we would call a literal interpretation. Thus, for instance, Paul unpacks the story of Abraham in a somewhat literal way, focussing on the chronological sequence of Yahweh’s relations with and establishment of a covenant with Abraham (in Galatians, as discussed in my other post). Yet he also juxtaposes a variety of other scriptural sources in relation to his exposition of Abraham’s story in a way that goes beyond a literal interpretation and is also focussed on the somewhat hidden, spiritual significance of the scriptures in question. In the process he also employs typological thinking, as explained below, in presenting Gentiles as sons of Abraham, or new Abrahams. Like all forms of interpretation discussed here, the interpreter is almost always concerned with applying the meaning that is found to the current situation of the interpreter and his (or her) listeners. 2) Pesher (literally, “solution” or “interpretation”) likewise involves finding the meanings presumed to be hidden within the Torah and, especially, prophetic writings like Jeremiah, Isaiah, and Hosea. Pesher may be considered a type of Midrash in some ways, but there is more of a focus on one-to-one correspondences in the interpretation of specific details of the scripture in question. Pesher is very much focussed on the hidden meanings that cannot be readily detected by just anyone. The author of Daniel frequently uses the term “pesher” to describe Daniel’s method of interpreting the details of dreams. Some members of the Dead Sea sect use the term pesher when they are doing very detailed, one-to-one intepretations regarding how details in the prophets (8th-6th centuries BCE) are in fact referring to specific powers or persons who can be identified in their own time (2nd-1st century BCE). By doing pesher, the interpreter is unlocking or decoding the “mystery” (raz). Pesher was (and still is) very important for apocalyptic thinkers who look for the veiled meaning behind details in the scriptures in order to find one-to-one correspondences with specific incidents or people in their own times, namely the end-times. For a discussion of pesher in the context of the Dead Sea scroll known as the Isaiah Pesher, see the West Semitic Research Project site here. 3) Allegorical approaches involve extracting the deeply hidden but always spiritual meaning in a particular passage or story in the Bible. Allegorical interpretation, which is figurative, is very far removed from a literal interpretation and often seeks to find hidden and seemingly obscure meanings that noone else had or would find in a passage. When Paul uses the story of Sarah and Hagar from Genesis (in Galatians 4:21-31) and interprets these two women as two covenants, two mountains, and two cities, he is doing allegorical interpretation. There is also a sense in which Paul concludes this allegory with typological application, however, since he finishes by saying that the readers who follow Paul are “children of promise”, like Isaac (they are new Isaacs). Philo of Alexandria, the first century Jewish philosopher, is well-known for his allegorical interpretations. For instance, as David Runia notes: “In the so-called Allegorical Commentary, which contains 21 books, Philo gives an elaborate commentary on the first 17 chapters of the book Genesis from a purely allegorical perspective. These chapters are not interpreted in terms of the primal history of man and God’s election of the people of Israel, but are read at a ‘deeper’ level as a profound account of the nature of the soul, her place in reality, and the experiences she undergoes as she searches for her divine origin and gains knowledge of her creator” (pp. 5-6 in article linked below). Runia provides an excellent introduction to Philo, including his allegorical methods: Philo, Alexandrian and Jew. Hindy Najman (U. Toronto) has an online article which discusses Philo’s typological and allegorical interpretation of the Cain and Abel stories in Genesis: Cain and Abel as Character Traits: A Study in the Allegorical Typology of Philo of Alexandria. 4) Typology involves viewing key figures or events in the stories of the Bible as ideal types that repeat themselves in subsequent history, particularly in the time of the interpreter. Paul is thinking typologically when he speaks of Jesus as the “second Adam”. Typological interpretation is evident throughout the Gospels, as when people in the story are presented as wondering whether Jesus is Elijah, Jeremiah, or one of the prophets (Mathew 16:14) or when Jesus is presented as seeing John the Baptist as the new Elijah (Mark 9:11-13). The Gospel of Matthew, in particular, provides a clear case of more thoroughgoing typological interpretation in the author’s presentation of Jesus as a new king David and a new Moses (see my post of Matthew’s portrait of Jesus here). For example, in the birth narrative Matthew juxtaposes particular stories about Moses’ birth with the birth of Jesus, and he sometimes quotes or alludes to specific passages or phrases relating to Moses’ story in the process of telling Jesus’ story. In writing this post, my memory was refreshed by: J.D.G. Dunn, Unity and Diversity in the New Testament (2nd edition; Harrisburg: Trinity Press, 1990) and R. N. Longenecker, Biblical Exegesis in the Apostolic Period (2nd edition; Grand Rapids: Eerdmans, 1999). The four types outlined above are also those listed by Dunn. Categories: Apocalypticism, Early Judaism and the diaspora, New Testament course series, Paul of Tarsus. November 1, 2006 . Paul’s relations with the communities of Jesus-followers he founded varied. While he has almost nothing but praise for those at Thessalonica (according to 1 Thess), I have already outlined his rocky relations with some of those at Corinth. If 2 Corinthians 1-9 actually comes (chronologically) after 2 Corinthians 10-13, then at least at Corinth these relations turned around and ended with some level of reconciliation. We lack any sign of reconciliation between Paul and the followers of Jesus in Galatia, however. (For more on this see the posts by Mark Goodacre, as listed further below). In a previous post on Paul, the Galatians, and circumcision (NT 1.6), I have discussed these rocky relations with the Galatians as well as the other teachers who Paul views as opponents to his own “good message”. In particular, there I focus on Paul’s interpretation (midrash) of the story of Abraham in order to counter his opponents’ views. “At present, however, I am going to Jerusalem with aid for the saints. For Macedonia and Achaia have been pleased to make some contribution for the poor among the saints at Jerusalem; they were pleased to do it, and indeed they are in debt to them, for if the Gentiles have come to share in their spiritual blessings, they ought also to be of service to them in material blessings. When therefore I have completed this, and have delivered to them what has been raised, I shall go on by way of you to Spain; and I know that when I come to you I shall come in the fulness of the blessing of Christ. I appeal to you, brethren, by our Lord Jesus Christ and by the love of the Spirit, to strive together with me in your prayers to God on my behalf, that I may be delivered from the unbelievers in Judea, and that my service for Jerusalem may be acceptable to the saints, so that by God’s will I may come to you with joy and be refreshed in your company” (Romans 15:25-32 [RSV]). UPDATE: Thanks to the mention by Mark Goodacre, I now see that Loren Rosson has a post addressing Paul’s feelings at the time of writing Romans: Why Paul Took Up the Collection (Rom 15:25-32). Categories: New Testament course series, Paul of Tarsus. October 27, 2006 . Paul’s relations with various groups of Christians at Corinth had its ups and downs, but mostly downs it seems. In the time leading up to his writing of what we call 1 Corinthians (actually at least his second letter to them — see 1 Cor 5:9), there were divisions among different groups meeting in different homes, and there were also divisions between those who, in Paul’s view, thought they were superior either socially or spiritually. Some wealthier members with time for leisure were arriving early for the Lord’s supper and consuming all the better food and wine before the arrival of the lower class Christians who had to work for a living (11:17-34). Some Corinthians who felt they had a special connection with things spiritual were viewing their ability to receive divine messages in the form of seemingly nonsensical languages (“tongues”) as a sign of superiority over those who did not receive such messages (12-14). Some other Corinthians, like the woman Chloe, who was likely a leader, were concerned about the situation and communicated this to Paul by messenger (1:11). Rocky relations continued or even intensified afterwards when Paul made another visit to Corinth, one that he calls a “painful visit” (2 Cor 2:1). A “tearful letter” (2:4) was soon to follow, and it seems that this tearful letter is at least partially preserved in 2 Corinthians 10-13. (2 Corinthians is most likely more than one letter, with chapters 10-13 chronologically predating chapters 1-9). In that tearful, angst-driven letter (2 Cor 10-13), Paul struggles with the problem that some among the Corinthian followers of Jesus were preferring some other travelling leaders who had arrived in Corinth after Paul’s departure. And these leaders were teaching about Jesus from another angle. Paul sarcastically calls these leaders “super-apostles” (12:11) and, like Paul, they were Jewish, not Gentile (11:22). What were their super-powers? Not flying. For one, they gave good speeches — better than Paul’s in the view of at least the educated Corinthian Jesus-followers. Paul characterizes these Corinthians as complaining that Paul is “humble when face to face” but “bold” when away (10:1). Furthermore, some of the Corinthians “say ‘His letters are weighty and strong, but his bodily presence is weak, and his speech of no account. '” (10:10; RSV). The derogatory view of Paul as a wimp may well be part of a larger problem of enmity which some Corinthians were showing towards the apostle. For, unlike the super-apostles who did accept the Corinthians’ financial support in their teaching endeavours (perhaps in line with the teaching of Jesus in Luke 10), Paul had blatantly rejected the Corinthians’ offer of a financial gift to support Paul’s activities. To top things off, he had rejected the Corinthians’ gift while accepting a similar gift from the more amicable Macedonians. He blatantly states this in the key passage 2 Cor 11:7-14 (likely the Philippians are in mind, as his letter to them clearly shows that he accepted gifts or benefactions from them). This sort of approach might only intensify the enmity. In the Greco-Roman world, such benefaction or patronage should be accepted if one did not want to shame the giver and trigger precisely the enmity of the giver (i.e. you would be treated as an enemy). According to such reciprocal, societal conventions, the appropriate response to benefaction would be for Paul to accept the gift and offer some form of honour in return. Saying that you were rejecting the gift and support so as to avoid “burdening” someone, as does Paul, wouldn’t do much. So the reasons why the Corinthians preferred the super-apostles over Paul was somewhat complicated, involving rhetorical ability, economic relations, and cultural conventions. “even if I made you sorry with my [tearful] letter, I do not regret it (though I did regret it), for I see that that letter grieved you, though only for a while. As it is, I rejoice, not because you were grieved, but because you were grieved into repenting; for you felt a godly grief, so that you suffered no loss through us” (2 Cor 7:8-9). (I won’t explain what I am alluding to in the opening line of this post, which, if I am lucky, will at most give one or two readers a retro-chuckle). Categories: New Testament course series, Paul of Tarsus. October 21, 2006 . Mark Goodacre’s post on the equivalence of the events described by Paul in Galatians 2:1-10 and by the author of Luke-Acts in Acts 15 — commonly called the Jerusalem council — provides a good overview of the discussion on these key passages involving Paul’s visit to Jerusalem. It has also sparked considerable debate (less so a “sharp contention” as in Acts 15:39) on whether another Jerusalem visit described by Acts, namely the one in Acts 11, is to be equated with Galatians 2 instead. The reason why this issue is so important and debated is that it has significant implications both for the chronology of Paul’s life and for the question of the historical (in a modern sense) reliability of the Acts of the Apostles. Check out the posts to see for yourself. The appearance of these blog posts is a timely development in light of the fact that we are comparing precisely these passages (Gal. 2:1-10 and Acts 15) in tutorials this week. Categories: Acts (of Apostles), New Testament course series, Paul of Tarsus. October 4, 2006 . The first century was marked by a series of tensions between certain Roman authorities and some Judeans that, in some ways, ultimately culminated in the Judean war and the destruction of the second temple by the Romans in 70 CE. While some Roman governors (procurators) of Judea seemed somewhat attentive to the peculiarities of Judean culture, including its monotheism and some of its laws, others were less so. Thus, for instance, Josephus relates a story about how the procurator or prefect Pilate (who is also known for his execution of Jesus in about 30 CE) attempted to have Roman standards (decorative shields) with images of the emperor placed within the city walls of Jerusalem (War 2. 169-171 //Antiquities 18.55). (There is a useful online article about Pilate). According to Josephus, the result was a significant, non-violent sit-in by a large crowd of Judeans who were greatly offended by the abrogation of Jewish laws concerning images. When Pilate decided he would have his guards surround the crowds and prepare to threaten death, the response by the Judeans was the extension of their necks in Josephus telling: we’ll die for our God’s laws. Pilate gave in this time, but this sort of incident could not be good for Roman public relations in Jerusalem and Judea. In his histories, Josephus recounts a number of other incidents involving clashes, some more violent than this one with Pilate, between Romans and inhabitants in this Roman province. “[W]hen the multitude were come together to Jerusalem, to the feast of unleavened bread, and a Roman cohort stood over the cloisters of the temple (for they always were armed, and kept guard at the festivals, to prevent any innovation which the multitude thus gathered together might make), one of the soldiers pulled back his garment, and cowering down after an indecent manner, turned his breech to the Jews, and spake such words as you might expect upon such a posture. At this the whole multitude had indignation, and made a clamor to Cumanus, that he would punish the soldier. The rasher part of the youth, and such as were naturally the most tumultuous, fell to fighting, and caught up stones, and threw them at the soldiers. Upon which Cumanus was afraid lest all the people should make an assault upon him, and sent to call for more armed men, who, when they came in great numbers into the cloisters, the Jews were in a very great consternation. Being beaten out of the temple, they ran into the city. The violence with which they crowded to get out was so great that they trod upon each other, and squeezed one another, till ten thousand of them were killed, insomuch that this feast became the cause of mourning to the whole nation, and every family lamented their own relations” (War 2.223-227; the translation here is William Whiston’s as cited on PACE (with punctuation slightly revised), which also supplies the parallel passage in Josephus’ Antiquities. These are just two examples of what repeated itself at certain points, contributing to what would become a full revolt in 66 CE. Categories: Early Judaism and the diaspora, Historical Jesus, Judaism in the homeland, New Testament course series. September 23, 2006 . The NTGateway also supplies several other useful links on textual criticism. Categories: New Testament course series. September 13, 2006 . In teaching early Christianity in a university setting, there are a number of assumptions and views that need to be corrected or dismantled in order to clear the way for students to make better sense of these ancient documents. Something that does not often occur to students and which needs to be highlighted again and again is that Christians of the first three centuries (and even beyond) did not have a New Testament! You heard me. They did have what they considered scriptures, namely the Jewish writings known as the Law and the Prophets, but the process that led to the collection of writings or canon we now know as the “New Testament” was a long one. (Obviously the notion of the Jewish scriptures being the “Old Testament” would have to await the existence of the “New” one). See Mark Goodacre’s list of links to online resources relating to canon for further discussions. In fact, the earliest evidence we have of any church body establishing a list of authoritative Christian books that coincides exactly with the 27 books now in the New Testament was in 393 CE. Even that emerged out of a local meeting of church authorities in North Africa rather than some “universal” decision that was implemented in some way. The process that led to the collection of writings that were considered authoritative as scripture, namely the canon, was a long one which I will not detail here, except to note that early on Christians were collecting and using Christian writings of various sorts. Sometimes one community used the same writings as another community, but seldom did everyone agree which ones should be considered “scripture”, if they considered this issue at all. In some cases writings accepted by one community could be utterly rejected as “heretical” by another, as was the case with many “gnostic” writings. The process of choosing the writings that were considered canon and excluding certain other documents was, in some ways, the triumph of one Christian view over another. To provide another example, in the mid-second century Marcion of Sinope had clear ideas of what he would include in an authoritative collection, including the Gospel of Luke and certain letters of Paul, but he did so in a way that tried to excise any passages that seemed to equate the Jewish God with the God who sent Jesus (he thought there were two gods involved). Others disagreed with Marcion, although some began to agree that it was worthwhile thinking about defining which writings were authoritative. One early list of writings that has survived, known as the Muratorian canon (perhaps from around 200 CE), happens to largely coincide with the books that were later included in the New Testament. But other Christians at this time would make a different list nonetheless, and even the Muratorian canon mentions an Apocalypse of Peter (perhaps the same one available here) which some held to be authoritative but which did not ultimately make it into the New Testament. And the issue of including or excluding the Apocalypse of John, also known as Revelation, continued to be hotly debated into the fourth century, for instance. Rather than get further into the long and complicated history behind the formation of the canon of scripture, here I wanted to briefly mention one important implication of the non-existence of the New Testament in the first centuries. In particular, the lack of any established, authoritative collection of writings and the variations in the writings used by different Christian groups reflected and further facilitated the continuation of variety or diversity among early Christians. And when there were differences of opinion regarding belief or practice among these diverse Christian groups, there was no set of early Christian writings that everyone could agree was the measure (the meaning of the word “canon” is “measure” or “rule”) or authority to settle disputes regarding what belief or practice was right or wrong. This means that the modern student of early Christianity should not assume that the views expressed in any one writing are somehow representative of all early Christian views. It also means that we should refrain from solving the dilemnas encountered in studying one early Christian writing by turning to another by a different author, as though they are all the same. Finally, we should consider the writings in the New Testament within the broader context of early Christian literature that did not make it in, and give each its due. For more on the diversity of early Christianity, see my series on the Christian Apocrypha and “Gnosticism”. For more on the development of the canon, see the resources mentioned on NTGateway. Categories: Christian origins and literature, New Testament course series, Pseudonymity, authority, and canon, Teaching the History of Religion. September 8, 2006 . This week we’ve been talking about Paul’s letter to the Galatians and the issue of circumcision (= “works of law” in Paul’s letter) as a symbol of belonging in the people of God. Paul was addressing a situation where other leaders of the Jesus movement had come to Galatia and were requiring, naturally, that Gentiles be circumcized and follow the Torah in order to belong to a Jewish movement. It seems that Paul (a trained Pharisee) is somewhat of an oddball (so to speak) within second temple Judaism and the early Jesus movement, not in his notion of including Gentiles but rather in his not requiring that such Gentiles be circumcized in order to express their belonging within this Jewish Jesus movement. Paul presents a somewhat complicated argument (in Galatians 3) using the sequence of Abraham’s (Abram’s) relations with Yahweh in order to show that the primary covenant with Abraham (Genesis 15) was established before the introduction of circumcision (Genesis 17), and that uncircumcized Gentiles can become “sons of Abraham” by doing what the uncircumcized Abraham did in Genesis 15: believing that what God says he will do will indeed happen (in Abraham’s case the promise was for innumerable heirs or offspring despite his childlessness to that point). Circumcision was not required of a Gentile in order to be a son of Abraham, argues Paul, since Abraham’s circumcision was only subsequent to the primary promise and covenant. The methods of biblical interpretation that Paul employs are very much Jewish midrash, but the conclusions he comes to regarding Abraham and the covenant are very different than what most other Jews engaging in midrash of Genesis would have concluded (Jews who would more likely focus more attention on Genesis 17, the circumcision of Abraham). Coincidentally Mark Goodacre has a post today that addresses some related issues and also points to an online article by Paula Fredriksen that is definitely worth a read: “Judaism, the Circumcision of Gentiles, and Apocalyptic Hope: Another Look at Galatians 1 and 2,” Journal of Theological Studies 42 (1991): 532-64. The views expressed in that article, particularly the notion that Paul’s position (Gentiles not required to be circumcized in order fully to join the group) is the normative one in the Jesus movement generally, differ from my own expressed above, however. Categories: New Testament course series, Paul of Tarsus. March 11, 2006 . In the history of civilizations, few people have made as much of an impact, directly or indirectly, as the guy who stands to your right (who died in 323 BCE). Although living over three hundred years before the origins of Christianity, his impact is in many ways essential for understanding Christian origins and the New Testament. Alexander, the son of Philip, King of Macedon (a.k.a Alexander “the Great”), successfully conquered a larger area than previously accomplished in the Ancient Near East and Mediterranean world, from Greece, Asia Minor (Turkey), Syria, Palestine, and Egypt to Iraq (Mesopotamia) and Iran (Persia), as far as India itself. What matters most for us is what Alexander and his successors brought with them: Hellenistic culture, including the Greek language, Greek modes of social and civic organization, Greek philosophies and religions. Although local languages and cultures continued in various areas, social and cultural interactions were now inevitable and the degree of assimilation to Hellenistic ways depended on the person, group, or situation. Moreover, this situation of considerable cultural commonalities across such a vast geographical space was unparalleled at the time. Alexander’s legacies can be seen in the fact that the New Testament, and most of early Christian literature, was written in Hellenistic Greek (also known as koine, or common, Greek), and Greek language carries with it Hellenistic culture. As a sect within Judaism, the Jesus movement in Palestine entered into a Jewish world already in interaction with Hellenism, as you can read about in my earlier brief discussion of the Jewish Maccabees (of the second century BCE). And as this Jewish movement made its way into cities throughout the Greco-Roman world (especially in the Greek East), further interaction with Hellenistic (and Roman) culture was the result. A figure like Paul of Tarsus (a Greek city in Asia Minor) seems to have been well-trained in Hellenistic modes of rhetoric (in how to make a good argument or speech), for instance. The Book of Hebrews expresses its understanding of Jesus’ significance in terms drawn not only from Judaism but also from Platonic philosophy, to provide another preview. We will see how important Hellenistic, as well as Roman, culture was for early Christianity as we continue in this series. For further web resources on Alexander the Great, including more photos, go here. For the Wikipedia article on Alexander, go here. Photo (by Phil): Statue of Alexander the Great from Magnesia on the Sipylos (by Menas, a sculptor from Pergamum), now in the Istanbul Archeological Museum (mid-third century BCE). Categories: Christian origins and literature, New Testament course series. January 12, 2006 . This is the first of what will be numerous posts on early Christian history and literature, especially the New Testament, in connection with an undergraduate course I am teaching this term. Early Christianity and religions of the ancient Mediterranean are my specialty, so there are already many entries here on this blog that will be relevant to Christian origins which you may wish to browse (click and consult the various categories on the right-sidebar). Come again, and feel free to post questions or comments. 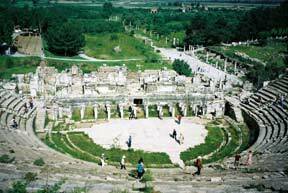 Photo: Theatre at Ephesus, where Christianity was established quite early (by Phil). Categories: Christian origins and literature, New Testament course series. December 29, 2005 .